It was six years ago when I found this blog sort of by accident while browsing about Dutch Prisoners of War during World War II in Java. The blog was written and initiated by Elizabeth van Kampen, a 89 year old Dutch woman who lived in Malang, a mountainous town located in the province of East Java from 1936 to 1944. She firstly came to that town as a student, and left it as a prisoner of war. It was pretty amazing how she could describe in details every single moment she went through in Malang: happy and joyous, sad and devastating, all were told in an interesting way that made me want to go and see the town by myself. Last month I flew to Malang in order to trace back the footsteps of Elizabeth van Kampen in that town. Sadly, I couldn’t go to all places she had been to due to the short holiday I had. For the following images, I used photoshop filter that emulates the look of vintage photos in 1940s so as to add the sense of nostalgic. 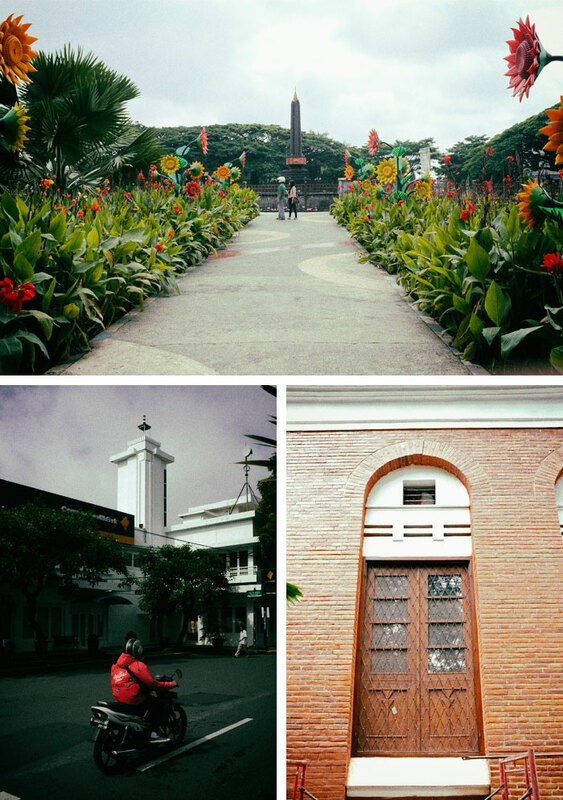 Malang is a beautiful colonial town. I stayed in a hotel occupying an old colonial house on Jalan Merbabu (formerly, Merbabustraat). As I walked around the neighbourhood in the morning, I could tell that this town was European town, just like Bandung. 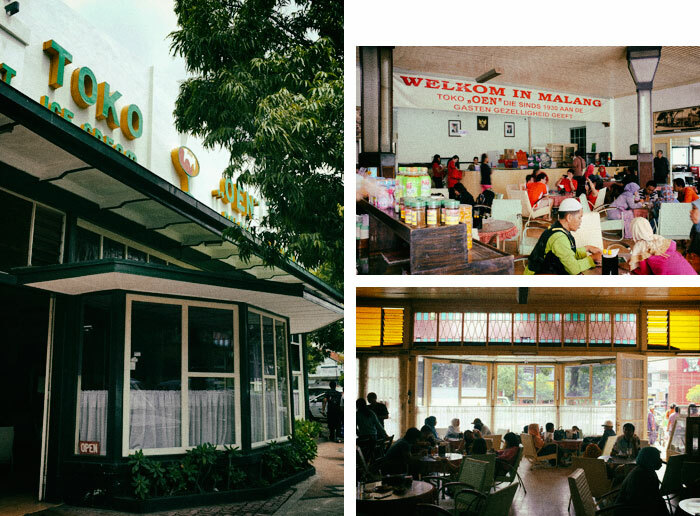 “The next day, after a delicious breakfast, we went into the city and I kept on saying: "I like Malang." My mother too was very pleased with this town in the mountains. Malang was, like Bandung, a European town; it had a really fine climate, nice and cool. There were many attractive modern shops. Both my parents were happy with this town Malang in East Java”. Many old colonial houses with steep roof could be easily found all over Malang. I was not sure how many Europeans lived in this town during the colonial time, but from the number of old churches I found, I could tell there was a lot of them. It’s always fascinating to photograph old Dutch churches. Not far from my hotel, the Cathedral of Malang stood on Jalan Ijen (formerly, Idjen Boulevard). It seemed to me that the Dutch always placed churches in certain locations so they could become landmarks in the neighborhoods. 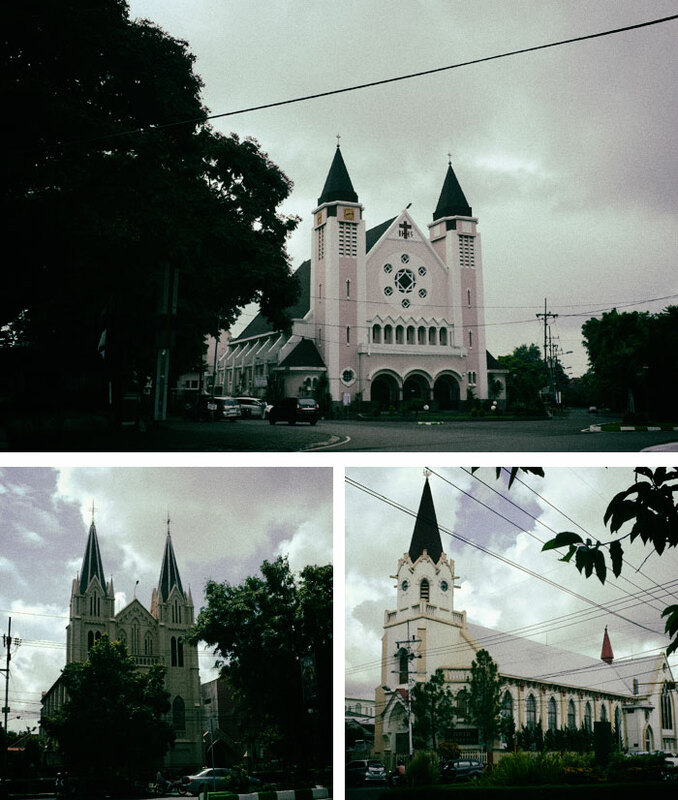 Another churches I found was the Roman Catholic Church and a Protestant church, both were located near the town square or Alun-alun as the locals called it. I was glad that the local authority had a good willing to preserve those old churches. I noticed that comparing to Protestant, the Catholics seemed to be more dominant in this town, at least in the colonial time. They left behind churches, hospitals, orphanages, convents, and of course, schools. In one morning, I went to see that Catholic boarding school run by the Sisters Ursulin. Sadly, I was not allowed to take pictures of the whole area by the security guy. So, I just looked around and captured it from the street. While I was capturing the windows, my mind suddenly flew to the time when the Japanese army marched on the street on the day they entered Malang. “The 9th of March, when we were in the recreation-room from our boarding-school while all the girls were looking through the windows into the streets, the Japanese entered Malang. My younger sister Henny and I stood there together. They came on bicycles or were just walking. They looked terrible, all with some clothes attached at the back of their caps, they looked very strange to us. This was a type of Japanese we had never seen before. Much later I learnt that there were also many Koreans in the shock-troops in service of the Japanese Army. Let’s get back to time when Elizabeth van Kampen came to this town for the very first time in 1936. It was Hotel Splendid where she and her family had to temporarily stay before moving the house on the plantation. I came to this hotel and sadly found that the building was being renovated. I guessed it was going to be revitalized into a nice hotel. I walked to the back of the hotel and found an old bridge spanning over the river of Kali Brantas. Standing on the river bank, I could see that the hotel was designed in certain ways so that the rooms had view to the river. Not far from the hotel, there was a circular park with a big lotus pond in the centre. To my sense, the park was built to complement the city hall located right across the park. I could say that this town must have been very beautiful in the past. No wonder if it was so memorable for Elizabeth van Kampen she would return to this town in 1996. Just like Bandung, the town of Malang was built with the funding came mostly from the planters. Thanks to the Stichting Malangsche Ziekenverpleging, a foundation iniated by Dutch planters, the town then had a hospital, firstly established in 1918. It was named Lavalette Kliniek, after G. Chr. Renardel de Lavalette, the chairman of the foundation. The hospital today still preserve the name of Lavalette. It becomes Rumah Sakit Lavalette. I came to this hospital in the morning. I walked through its long corridor that bisected a large green garden and soon realized how nice the environment was. It’s a good healing place for sick people. For young Elizabeth van Kampen, this place had inspired her to become a nurse one day when she grew up. Sadly, the war had ruined that dream. However, some good memories of this hospital remain alive in her mind. ”On the 20th December when I returned from school, my landlady told me that I had to go to the hospital, the Lavalette Clinic. My mother was there, and I had a baby sister. The lady had bought some lovely flowers for my mother so I wouldn’t have to go empty-handed. The hospital was not far and, since I knew the way, I could go by myself. The trouble was…I didn’t want to go; I had wanted a brother, not another sister. But the elderly lady became very angry with me and ordered me to go as fast as I could to visit my mother and new sister. Another good memory she had of this hospital happened during the World War when somewhere in May 1943, a nice and kind hearted Japanese doctor helped her sister, Henny van Kampen, to recover. Later, the doctor gave her mom a small box full of medicines for Henny. I found this very ironic, it’s like a paradox, because a month after that, Elizabeth, together with her sisters, and mother, was forced by the Japanese authority to leave their house for the internment camp in Malang. So, it’s like there were two different types of Japanese in that circumstance of war. A nice one and a bad one. Their first internment camp was located on Welirangstraat (today, it’s Jalan Welirang). The camp was known as De Wijk, Dutch word for District. It had been a nice European residential area before the war. ”The truck that drove us from Sumber Sewu to Malang stopped in front of the Welirang street 43 A, a street I knew very well. Our luggage was put on the pavement and so my mother, Henny and I brought everything inside. In my last morning in Malang, I went to Jalan Welirang to find the house number 43A. Today, it is still a nice residential area with many colonial houses. I walked back and forth along the street and couldn’t find it. Next to house number 41, it was a house number 43, and then 45, etc. 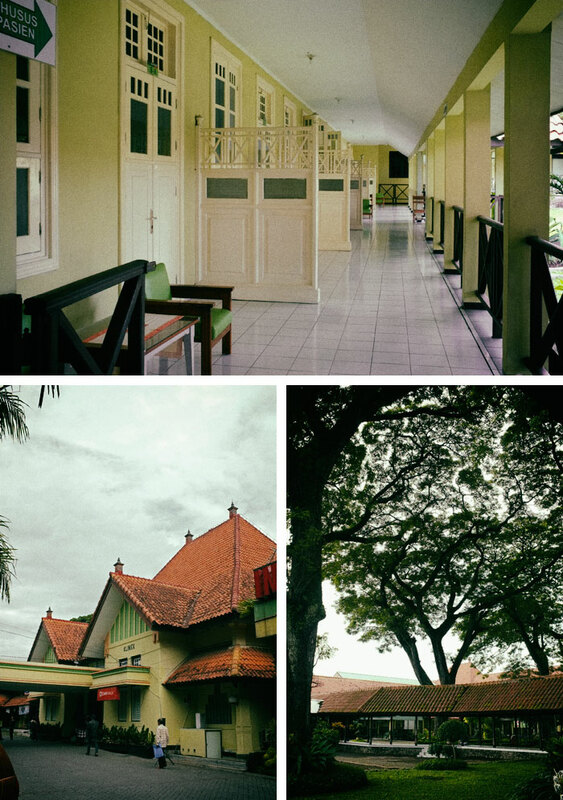 In 1996, Elizabeth van Kampen made a journey back to Malang and took a picture of the house. I counted on the picture and still, I couldn’t find it. Maybe the town had rearranged the numbers, or maybe the house had been renovated. The only door open that morning was of the house number 41 which had been turned into a fancy café named Rumah Opa (Grandpa’s House), yet its colonial house architecture was still preserved. I entered the house, tried to find someone whom I could ask about the house number 43A. I met a guy who was sweeping the floor that morning. He had no idea where the house I was asking about, even when I showed him the picture taken by Elizabeth van Kampen in 1996. So, I walked out and stopped in a room which must have been a guest room in the past, where there were some old pictures on the walls, taken during colonial time. The most striking picture was the one of Queen Wilhelmina. For a moment, I felt like getting back in time, being in an old colonial house in a colonial neighborhood and met the queen of Holland. Coming out from the house, I once again looked around that nice neighborhood. I could hardly imagine how terrible this place was when it became “De wijk” during the war. 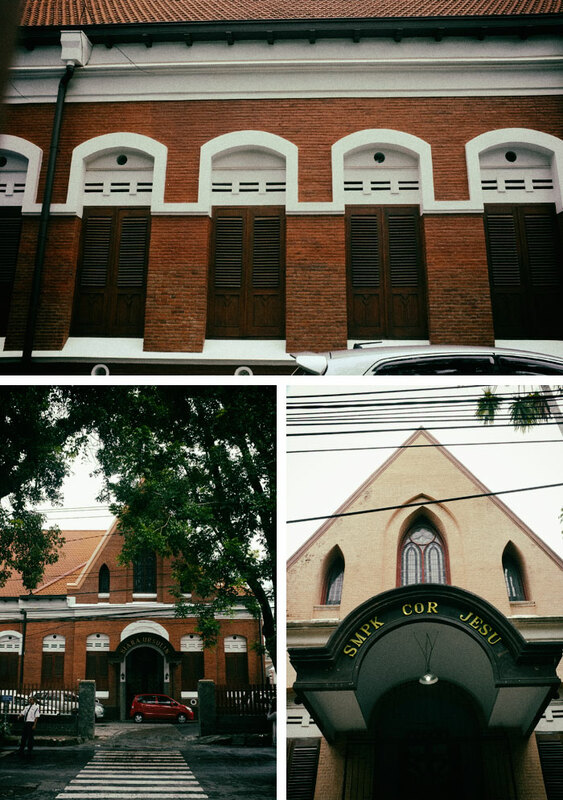 Not far from Jalan Welirang, there’s an old Christian high school on Jalan Semeru. The school used to be occupied by the notorious Japanese secret military police of Kempeitai. The Kempeitai was known and dreaded for their brutal treatment toward their prisoners. No one would mess around with them. Not only were the Dutch and Europeans who became their captives, but also the Chinese and native Indonesian. Many horrifying stories of their inhuman brutalities were revealed after the war was over. “One bad afternoon I went with four boys and a girl to one of the three forbidden houses in the Welirang street, I have forgotten the numbers, but those three houses were behind the Kempeitai building, once a Christian high school, in the Semeru street. The Kempeitai was of course outside our camp, there was quite some barbed wire between the Semeru street and the Welirang street. The three houses behind the Kempeitai were empty, and the doors were locked, so the six of us crawled to the back garden. Luckily there were trees and shrubs so we could hide ourselves behind them. We couldn’t see much, but what we heard was more than enough. I was really scared when I heard people, men and women, screaming in death agony. I went to that high school on Jalan Semeru. It still belongs to Christian foundation until today. The building was painted with striking orange color. It didn’t look like a once killing place, well at least on the daytime when I took some pictures of it. I felt deeply sorry however for those who were killed savagely in this building by the Kempeitai. 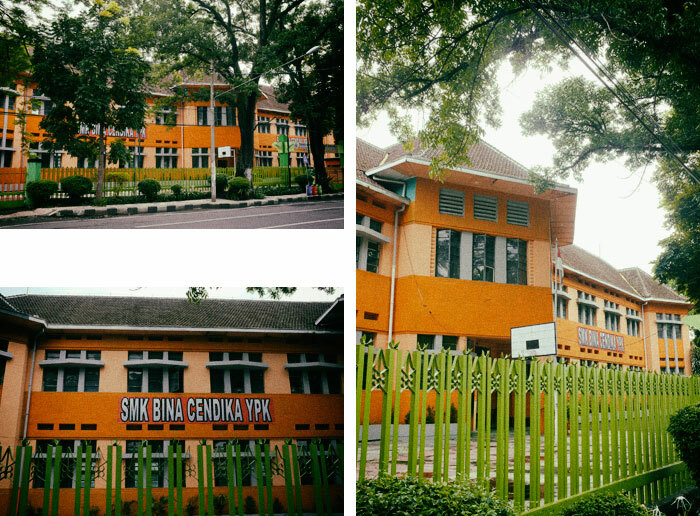 As an Indonesian who believed in ghostly figure and spirit, I could a little bit sense that there were some negative energies around this school. All I could do was saying a prayer, may God rest their souls. The last place in Malang I came to in order to trace back the footsteps of Elizabeth van Kampen was Toko Oen, an old restaurant established by the Chinese family of Oen in 1930s. There had been many memories Elizabeth van Kampen had in this old restaurant, even since the first time she came to Malang. The restaurant was located not far from the town square. I was attracted most by its bay window that gave the impression of Europe. Until now, they still serve European foods, cookies, cakes, and some delights that could hardly found in any modern restaurants. It was true! Despite of many fancy modern places to hang out emerged in Malang, this old restaurant was always full of people. I first came to this place at nine in the evening for a late supper and was told that all the foods in the menu was already sold out. So I returned on the following morning and found that all the tables were full. I guessed next time I should come on the weekdays. Finally, it was time for me to leave Malang. On the way to the airport, I passed by more and more colonial buildings, and that strengthened the impression of Malang as a once beautiful European town in Java as was described by Elizabeth van Kampen. I was convinced to return one day and see more places she had been to in Malang. Slowly, the town was gone from my sight. I whispered to say good bye, not only to its buildings, but also to many stories and spirits left behind.